This book explores the position of Islamic theology and jurisprudence towards people with disabilities. It investigates how early and modern Muslim scholars tried to reconcile their existence with the concept of a merciful God, and also looks at how people with disabilities might live a dignified and productive life within an Islamic context. 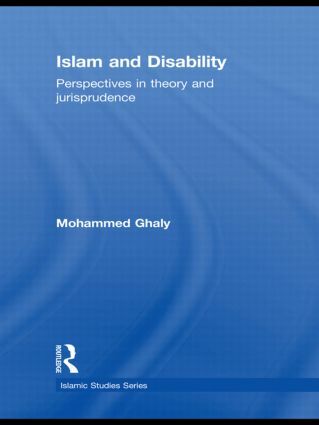 In his analysis of Islamic Theology, Ghaly pays attention to how theologians, philosophers and Sufis reflected on the purposes behind the existence of this phenomenon, and how to reconcile the existence of disability with specific divine attributes and an All-Merciful God. Simultaneously exploring the perspective of Muslim jurists, the book focuses on how people with disabilities can lead a dignified life in the financial and non-financial sense, in an extensive analysis of topics such as the human dignity of people with disabilities and the role of Greek physiognomy, their employability, medical treatment, social life with main focus on marriage-related issues, financial life and means of living. Investigating the topic of disability from early and modern Islamic perspectives, the author provides an analysis of Muslim discussions on various bioethical questions. As such, this book will be of great relevance to current heated debates on human rights of people with disabilities, as well as providing a valuable resource for courses on Multicultural bioethics, Islamic theology, Islamic law and medical anthropology. Human dignity of people with disabilities: influence of physiognomy?